It’s nearly two years since I wrote about session printing, in which the user doesn’t need to modify a locally running CUPS instance in order to print to a network printer. The main advantage of having printing running entirely in the user session is that no special privileges are needed. After all, all you need to do is send the document over the network. So what’s the current state of play? Wanted to write this up in case someone else is scratching their head with the same issue. Some routers are able to use both 2.4 GHz and 5 GHz frequencies, allowing devices to appear as though they are on the same network regardless of which they use. These actually provide two different wireless networks, with different SSIDs, and bridge between the two. This works fine for most things, but today I realised that it’s the cause of a printer problem I’d been having. The printer was using the 2.4 GHz network while my laptop was using the 5 GHz one. When I tried to print, the mDNS name of the printer was needed so a multicast query was sent… but the printer didn’t respond. The reason is the printer never received the query. The mDNS multicast address is 224.0.0.251, which is for multicast to the local subnet only. My router interprets this to mean that packets sent on the 2.4 GHz network will not reach the 5 GHz network. 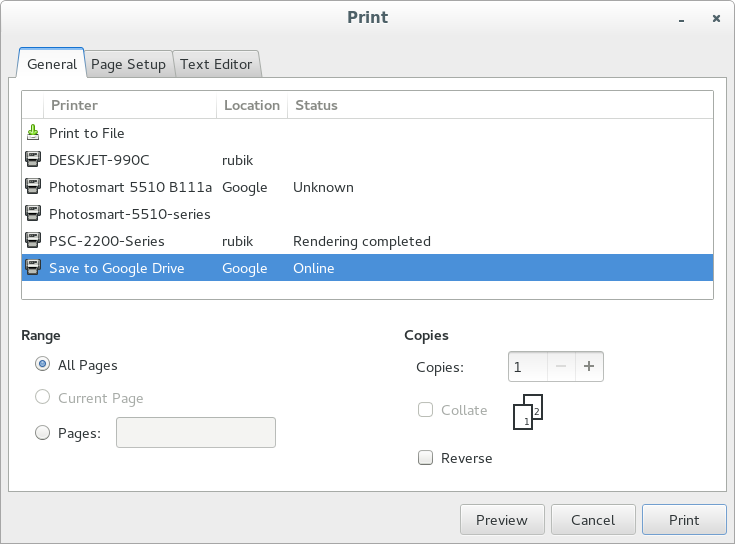 I’ve been working on a Google Cloud Print GTK+ print module. 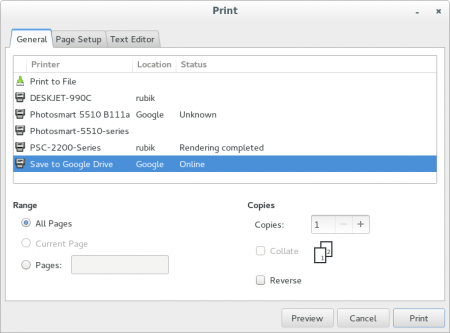 Google Cloud Print is a web service provided by Google that allows people to share their printers. In addition to being able to print to printers shared that way, there is a cloud equivalent of “Print to file” in the form of “Save to Google Drive”. The cloudprint module uses gnome-online-accounts to obtain the OAuth 2.0 access token for the Google account, which is why the Google goa backend needs an additional scope. Currently it can discover available printers, get simple details about them such as display name and status, and submit jobs without any special options. I plan to add options-setting based on the capabilities advertised by the printer. To try it out you’ll need to patch gnome-online-accounts and gtk+. For quite a while now I’ve used the drwright application to configure typing breaks. Once every so often, the desktop would refuse keyboard input and tell me to go and walk around for a few minutes instead. This helps to prevent RSI and other problems. Since Fedora 19, though, drwright is no longer usable. No matter, I switched to Workrave as that is a similar application although with more tweakable options than I needed. But now in Fedora 20 (currently in Beta) the problem of not being able to adjust configuration settings has affected Workrave as well! This time it’s a different bug, but not being able to right-click and get a context menu on the icon makes it pretty hard to use. Doesn’t anyone else set typing breaks? Next Tuesday (5th of November — should be easy to remember) is the Printing Test Day for Fedora 20. Let’s all try to break printing at the same time in strange and unusual ways! If you have access to a printer that day, take a look at the Test Day page for instructions on the sorts of things to try. This time we’ll be using the Testday App for submitting results rather than making people have to edit the wiki page.